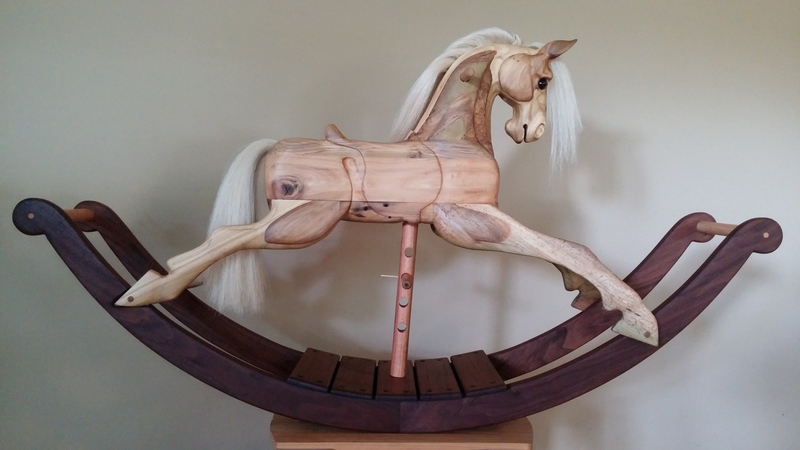 Heartwood Rocking Horses are designed with a child’s safety, health, and FUN requirements in mind! They are made sustainably harvested hardwoods from the local area. When painted or oiled, the horses and toys have a rustic, natural look, and are silky smooth to the touch and durable in every way. They are completely non-toxic and safe for your teething toddler. Find out more about the wood and finishes in the materials section. I also love creating horse art and horse portraits. Horses are a favorite artistic subject for us humans. They have a unique expressiveness and beauty that we all seem to connect with. Many families today are looking for wooden toys as an alternative to plastic, mass-produced toys. Wooden toys are durable, last many generations, and often hold a fond place in the hearts and memories of children and adults alike! The rocking horses encourage imagination and creativity, as well as develop motor skills. My designs are based on making the horse child-friendly, rather than making them decorations to just sit in a corner. My goal is to provide heirloom quality beauty with lifetime durability that children will enjoy for many generations!